Affordable and the best bang for buck when it comes to enjoying your racing games. The Sim Racing Wheel brings the best immersion when it comes to racing games. Instead of using a keyboard, or even a controller, the wheel and pedals give the best control over your vehicle's input. This category is filled with choice, even for under a $100 purchases all the way to the $400 sets. Ultimately this will be a great step up and provide you with the gear to get more out of your (sim) racing games. If you have a little bit more room in your budget, there are some great bundles available to get you going. 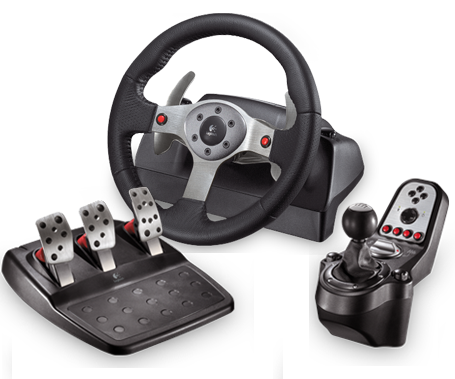 The Logitech G-Series is a great starting point when you want to dive into racing sims. Especially second hand you might be able to pick up a G25 for cheap. High quality products and more custom builds, with their respective price tags and DiY efforts. At the Sim Enthusiast level we start to see high quality products, with their respective price tags. Just like the Casual & Gamer category, there is a wide range in budget to fill this need. It's no longer a given that your purchasse consists of a full set of Wheels, Pedals and gearbox. Instead we see separate parts with the idea that you combine your pedal set with that new wheel you wanted. This also makes it easier to upgrade one part at a time, as long as your gear is compatible! 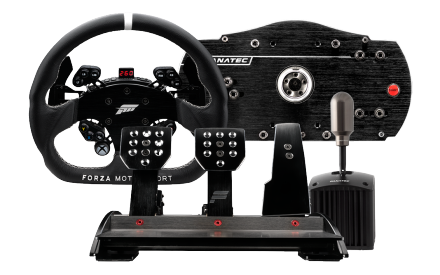 Fanatec has a great range of sets available right in the Enthusiast bracket. They offer both bundles and separate parts. Both the standard and more advanced wheel bases, called the CSL Elite Wheel Base and ClubSport Wheel Base V2.5 respectively, feature Fanatec's Quick Release System which allows for swapping wheels without having to exit your game. This is useful when you are a versatile racer that competes in single seaters, for which you use your Formula steering wheel, as well as GT3 for which you use the GT wheel. This quick release system makes for a flexible steering wheel setup. And did we mention there are over 20 compatible steering wheels available? Whether you are looking to get the right gear for your first set, or you are upgrading your beloved budget setup for something more serious, check out the Fanatec's Wheels & Sets overview page. The sky is the limit kind of category with a price tag focused on the business & enterprise side, better dig deep. The final category really is a the sky is the limit kind of bucket. Here we can go full custom and find professional simulator gear as well. This is what most people dream of having, yet you might need to remortgage your house for funding and make sure you have a spare room available for all this fancy equipment.